saunter outside to the open air car to take photos of the scenery as you pass. It’s cost effective if you are 1 or 2 people and want to stay overnight along the route. From Christchurch to Greymouth, in 2017 the cost is $139-219 NZ 1-way with 2 stopovers. Renting a car might be cheaper for 2+ people; however, the driver can’t sit back and enjoy the sights, and everyone will miss the informative streaming history audio. What are the 5 reasons to take the train through New Zealand’s Southern Alps? 2. The TranzAlpine Scenic Railway Journey a comfortable easy way to see the stunning countryside and mountains. If you book in advance, be sure to request the type of seat you want (table if you are 4 or not; for the best views, ask to sit on the right side when going towards Greymouth, and on the left side when returning to Christchurch; if you want to take lots of photos, ask to sit close to the open air car). better than at the 1st stop – Arthur’s Pass. 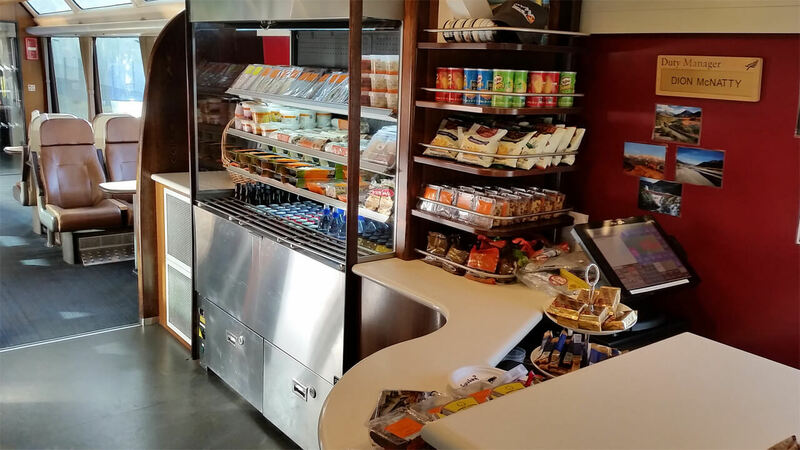 A café-bar is situated in the center of the car, offers tea, great coffee, wine, beer, spirits, soft drinks, bottled water, snacks, and delicious microwaveable meals. Cash is preferred and sometimes the only option. 4. Stop overnight in 2 very different areas before arriving in Greymouth on the third stop. Greymouth is on the West Coast. At no extra cost for the train, conveniently stop at the two scenic areas and spend a night or two at each. If jet-lagged when arriving in Christchurch, as we were, it’s a great way to see the internal countryside sights and delay a car rental until adjusted to the time change. Arthur’s Pass with forest and hiking paths is rich with earthy aromas, and forest floors laden with a multitude of moss varieties, unlike anything I have ever seen, and each more interesting looking than the last. It is evident how these forests inspired the likes of the Hobbit and Lord of the Rings. Visit and climb to the Devil’s Punchbowl. While a bit steep and wet, it is not too difficult of a hike if you can sustain your breath as you ascend. The Devil’s Punchbowl waterfall felt like Niagara Falls, only quite a bit smaller. The Falls can be difficult to photograph; the camera gets wet from the mist of the thundering Falls. They are beautiful though and well worth the hike and attempting to photograph them. The town of Arthur’s Pass is quite small, with one store that has a few basic provisions and a little café with limited food; I bought a can of salmon, rice cakes and water. There is a restaurant, Wobbly Kea that is open sometimes – for 2 hours on the day we were there; not one I would recommend, as the selection is limited and pricey. Instead, eat on the TranzAlpine Scenic Railway, as the food is very good and priced better than Arthur’s Pass restaurants. Also, don’t miss the Post Office. It is unlike most you will see. The main reason to go to Arthur’s Pass and stay overnight is to leisurely see the scenery from the TranzAlpine Scenic Railway, and to do some of the wonderful hikes. There are just a few places to stay. We stayed in a 1 bedroom older cabin at Arthur’s Pass Alpine Motel, looking out at the National Park. We had a kitchen, and I am glad I brought food from Christchurch. I would call it a 2 star, and it was clean and comfortable enough for 1 night. The owners are pleasant, helpful and accommodating. They picked us up and took us back to the train at no charge, and drove us and picked us up from a restaurant since it was raining. There are other places including a high end wilderness lodge, at a much higher rate. For some places a car is needed. There are some options for accommodations. Moana on the shore of Lake Brunner is the second stop. It was a planned destination, and one that we missed due to mudslides blocking the railway and the roads. It sounds delightful, with walks/ hikes, panoramic views, and water sports on the lake. Looks like a great stop for one or two nights on the way to the Greymouth on the West Coast. Greymouth, the third and final stop, is the largest town on the South Island ‘s West Coast. Greymouth has a history of gold and coal mining; forestry and fishing are key industries in the town today. Look for the famous Pounamu (greenstone or jade) shops and galleries. Greymouth is a great starting point to visit west coast beaches, wild coastline, scenic rock overlooks, and mountain glaciers. Hiking or tramping, as the New Zealanders call it, scenic glacial flights, ocean sports, and more are easily accessible from Greymouth. If taking the TranzAlpine Scenic Railway to Greymouth, it is a good place to catch a bus to access the west coast and south, or rent a car to go north or south. The TranzAlpine is operated by KiwiRail, a government owned national rail operator. 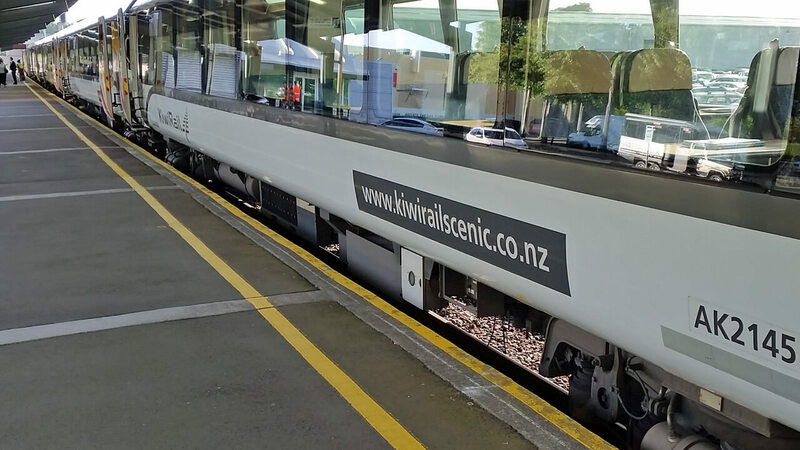 The TranzAlpine Scenic Railway Journey is considered one of the ‘world’s great train journeys.’ For timetables and bookings, please see their contact page: https://www.greatjourneysofnz.co.nz/tranzalpine. It’s delightful to take the TranzAlpine Scenic Railway to explore areas like Arthur’s Pass, Moana and Lake Brunner, Greymouth, and to access the West Coast beginning from the train station in Greymouth. Buses leave just outside of the train station for west coast destinations. Stay tuned for our next article on Akaroa, New Zealand, a small French settlement, beach town on the Banks Peninsula. 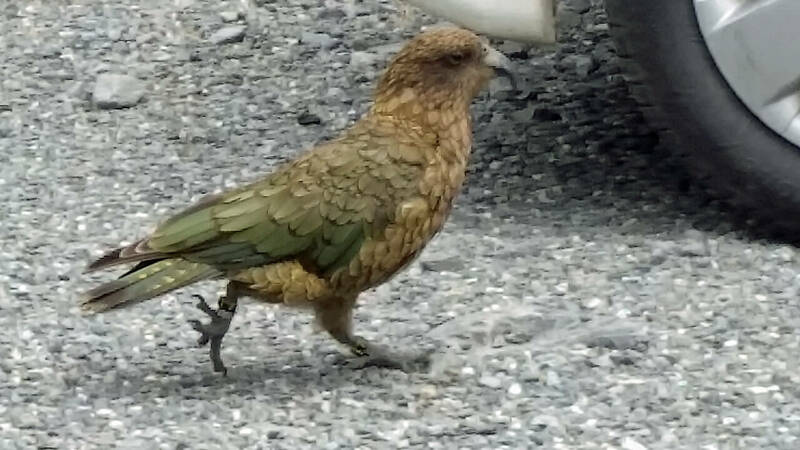 This entry was posted in Arthur's Pass, Greymouth, Moana, New Zealand, Southern Alps and tagged Arthur's Pass, Greymouth, Hiking, International Travel, Kea Parrots, KiwiRail, Lake Brunner, Land Adventures, Moana, Nature, New Zealand, New Zealand's South Island, Outdoor Adventures, Parrots, Southern Alps, TranzAlpine Scenic Railway, Travel, Travel Information by Wendy. Bookmark the permalink. I’m a big fan of trains. They’re so comfortable and so much easier than driving. And that scenery is amazing. I would love to take this train ride! My daughter has migrated to Melbourne and I am here for 4 months. Will go to New Zealand in August. Thank you for this tip. We visited New Zealand’s South Island in 2002. New Zealand drives on the wrong side of the road — for us. When we drive on the wrong side, it takes two of us to drive: the official driver and the other driver to remind them to stay on the correct side. Therefore, it is difficult to truly enjoy the scenery. It sounds like this train would be a great alternative. We did a 4 night Milford Track hike when we were there. In addition to the beautiful scenery and well maintained trails, the other wonderful thing about hiking in NZ is that there are no bears or snakes!!! Tom was quick to adjust to driving on the left; honestly, he used to do it – 20 years ago for work when in the UK. Still it was a long time ago. I recommend not renting a car immediately and watch those who drive you while picturing yourself doing the driving. Tom did this and it helped when we rented a car 5 days after arriving. I had to help him remember in parking lots and at circles, but otherwise, I was taking scenery photos, or just watching it go by. I drove a little, so Tom could watch the scenery and rest. The open air car looks so spacious and i believe the view from there is absolutely breathtaking. My former employer has a branch in New Zealand and I always wanted to apply for work there so I can get to know more of this beautiful country. Now your train journey just makes me want to book a flight and then hop on the Tranzalpine to explore South Alps. The southern part of the world is too beautiful!